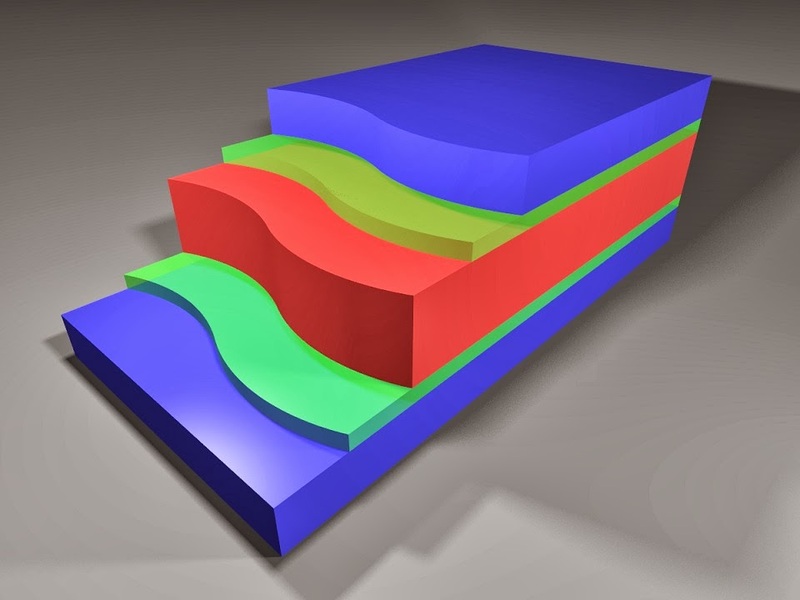 This artistic drawing of the proposed quantum well energy harvester shows the central hot region in red, the quantum wells in green, and the cold electrodes in blue. Credit: Bjӧrn Sothmann, et al. By collecting heat energy from the environment and transforming it into electrical power, thermoelectric energy harvesters have the potential to provide energy for a variety of small electronic devices. Currently, the biggest challenge in developing thermoelectric energy harvesters is to make systems that are both powerful and efficient at the same time. One material that scientists have experimented with for making thermoelectric energy harvesters is quantum dots, nano-sized crystals with semiconducting properties. Due to their sharp, discrete energy levels, quantum dots are good energy filters, which is an important property for thermoelectric devices. In a new study published in the New Journal of Physics, a team of researchers from Switzerland, Spain, and the US has investigated a thermoelectric energy harvester design based on quantum wells. Although quantum wells are also made of semiconducting materials, they have different structures and energy-filtering properties than quantum dots. "We have shown that quantum wells can be used as powerful and efficient energy harvesters," said coauthor Björn Sothmann, a physicist at the University of Geneva in Switzerland. "Compared to our previous proposal based on quantum dots, quantum wells are easier to fabricate and offer the potential to be operated at room temperature." The energy harvester design that the researchers investigated here consists of a central cavity connected via quantum wells to two electronic reservoirs. The central cavity is kept at a hotter temperature than the two electronic reservoirs, and the quantum wells act as filters that allow electrons of certain energies to pass through. In general, the greater the temperature difference between the central cavity and the reservoirs, the greater the electron flow and output power. In their analysis, the researchers found that the quantum well energy harvester delivers an output power of about 0.18 W/cm2 for a temperature difference of 1 K, which is nearly double the power of a quantum dot energy harvester. This increased power is due to the ability of quantum wells to deliver larger currents compared to quantum dots as a result of their extra degrees of freedom. Although the quantum well energy harvester has a good efficiency, the efficiency is slightly lower than that of energy harvesters based on quantum dots. The researchers explain that this difference occurs because of the difference in energy filtering: quantum wells transmit electrons of any energy above a certain level, while quantum dots are more selective and let only electrons of a specific energy pass through. As a result, quantum wells are less efficient energy filters. Quantum well energy harvesters appear promising for applications. For one thing, they may be easier to fabricate than energy harvesters that use quantum dots, since quantum dots are required to have similar properties in order to achieve good performance, and there is no such requirement for quantum wells. In addition, the fact that they can operate at room temperature may make quantum well energy harvesters suitable for a variety of applications, such as electric circuits. "The energy harvester can be used to convert waste heat from electric circuits, e.g. in computer chips, back into electricity," Sothmann said. "This way, one can reduce both the consumed power as well as the need for cooling the chip." The researchers hope that their work encourages experimental groups to build and test the device.